I totally know that there are no spaces in the last sentence, but really my mind thought that as practially one burst of thought. Either way, the book I've anticipated being here for quite some time has arrived! On Christmas break I went to the CRU Midsouth conference, Encounter. At one point they split up guys and girls, and Emily Freeman was our phenomenal speaker. I was sitting with the other girls from my campus, when something in my brained clicked. She has many of the same mannerisms as me. There, in the very back of the auditorium, I felt like I was looking into my mirror on stage, down to the way she made nervous comments to herself. I leaned over and said to my dear friend, "I feel like I'm watching myself," to which she replied, "Oh my goodness, I was just about to tell you that!" 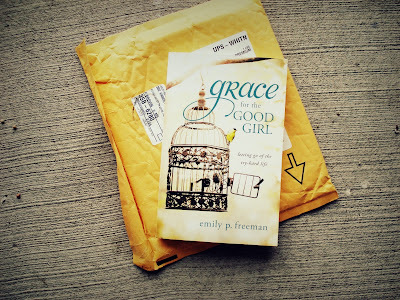 Then and there I decided I needed to read Grace for the Good Girl. While I haven't met her in real life, her topic of letting go of the try-hard life makes me feel as if we're in some ways kindred souls. So, yes, I'm ready to finish the long list of half-finished books, so I can finally open this one! What books are you far too excited about reading?